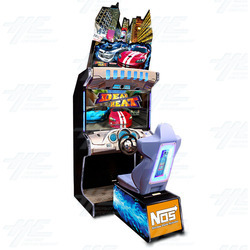 Dead Heat 42" is the redesigned exhilarating, high definition, head-to-head car racing game from Namco that now comes with a 42" LCD screen to further immerse players in the racing experience. The game involves eight racers, and links up to four real-time players. It's not just the neck-and-neck style of this game that sets it apart, but the unique use of the player profiles and the in-game player identification gives it an edge as well. Using a PIN system like other racing games, players can store information such as high scores and friends/competitors you've played, but the profile also stores players driving styles. If your friend isn't able to make a race, no problem, just apply your friends driving style, and the computer will simulate their driving style for you to race against! Namco have also addressed the issue of trying to figure out which cars are your friends on the course by taking a snapshot of players before the race, and displays the photo above the players vehicles, making it easier to find and eliminate your friends on the track. 42" LCD screen with High Definition Graphics. Links up to four players. Players profiles available through PIN system to store high scores, and keep track of friends and competitors. Driving style is also stored as information,so players can race against friends who aren't present at the time. Camera on machine takes players photo before race, and displays photo above the players car during race for easy identification. 8 customizable cars to choose from (both Japanese and American). 4 city race locations are geographically accurate to the real locations.